Last night my bhabhi Santoshi had prepared this yummy mushroom biryani and the taste was mindblowing…Coming back to the recipe,Santoshi used her own measurements and ideas by referring some recipes from her handwritten book and I adapted it from her.Whenever I like any recipe I have to prepare it as early as possible and when ingredients are all in handy, why not?This is one of the best biryani I have ever prepared. Wash the rice and soak it in the water mentioned above with all the ingredients for 10 minutes. 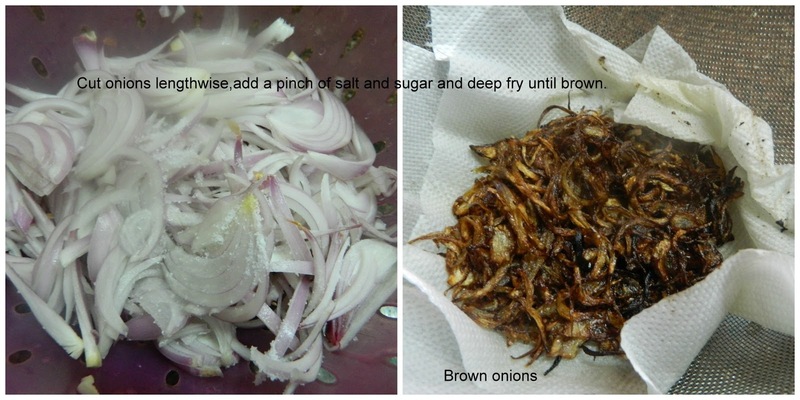 Cook it in a rice cooker or normal cooker for 1 whistle. I cooked it in a rice cooker. Once cooked,separate the grains slightly and cool it completely. Marinate the mushrooms with all the ingredients mentioned in the list for half an hour or more. Heat ghee in a pan,fry onions until translucent,add ginger garlic paste,tomato puree and fry until the raw smell disappears. Add coriander powder,biryani masala powder,curds and saute it for sometime. Add chilly powder for extra spice only if required. Add marinated mushrooms, check salt,add if required and close the lid and cook it for 6-7 minutes. Lastly add cashew paste,brown onions,little water and take a boil. Preheat the oven at 160 D C.
Take a borosil bowl,add a layer of mushroom curry. Spread a layer of rice. Sprinkle chopped coriander leaves and mint leaves. Sprinkle saffron milk,brown onions,kewra essence,rose water. Garnish all the ingredients and lastly add 2 tbsp of ghee. Cover it with Aluminium foil and bake it in the oven for 20 minutes. You may also give dum in microwave by covering it with cling film. You may also give dum by layering it in a thick broad vessel and giving dum in gas with a tawa below the vessel. You may also keep the rice and gravy separate and relish .